From the earliest times, the possibility of harnessing even a tiny fraction of the falls’ energy brought forth the visionaries, the dreamers and, of course, the schemers. 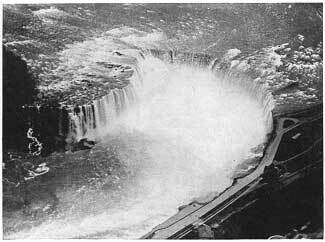 Early schemes involved locating a large cluster of factories adjacent to the falls and providing each with a flow of water with which to power its individual water wheel. The first serious attempt at a hydroelectric generating plant began in 1890 with the formation of the Cataract Construction Company. By 1893, plans were sufficiently well developed that proposals were solicited from American and European electrical companies. The scale of the undertaking was enormous. 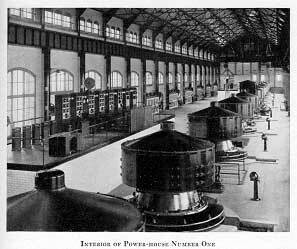 When completed, the power plant would house ten generators, each rated at 5,000 horsepower. Up to that time, the largest generator ever demonstrated was 1,000 horsepower. The initial bid was for three generators, together with their ancillary equipment. The choice came down to General Electric vs. Westinghouse, with Westinghouse winning the contract. Two generators were installed and delivered power to a local factory in 1895. Power was to be transmitted to Buffalo over a 22-mile, 10kV transmission line. The weak point of the line was, of course, the insulators. Trial orders were placed with six manufacturers and the insulators were tested by Cataract engineers. They all failed, except for the U-937 “Niagara Helmet” designed by Fred Locke and manufactured by Imperial Porcelain. 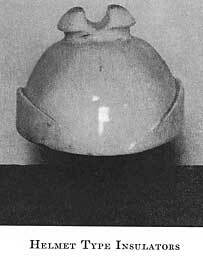 Its oval shape made this insulator difficult to produce, so Imperial Porcelain supplied a round version, the U-934, directly to the contractor building the line. The story is told in detail in Elton Gish’s great biography of Fred Locke. After the initial start-up period in late 1896 and early 1897, only these two insulator styles were found acceptable for service on the line.